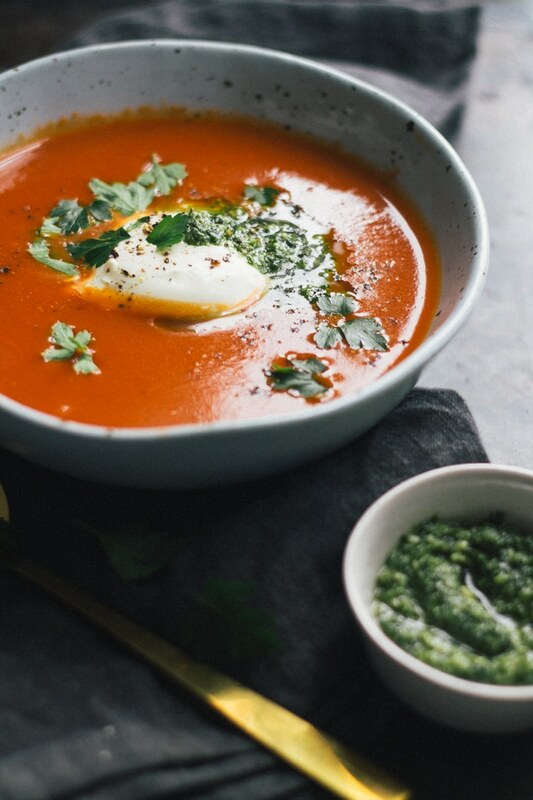 I’m not quite sure why I chose to do a post on soup. Easy(!) 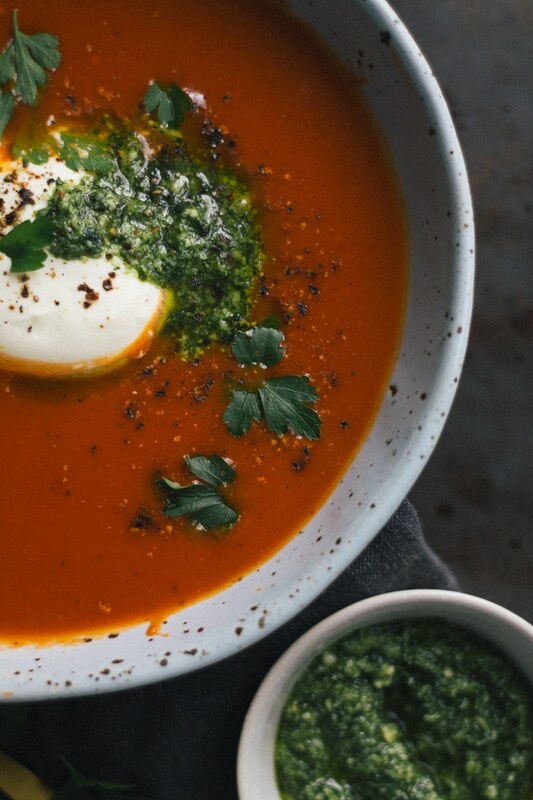 Roasted Tomato and Garlic Soup with creamy Creme Fraiche and Pesto to be exact. While this recipe is delicious, easy and a perfect weeknight dinner or lunch in the winter I’m stuck for what to write because, well, come on?! It’s soup (or maybe I’m just a little braindead today after my toddler and preschooler got me up seven, yes seven, times last night). 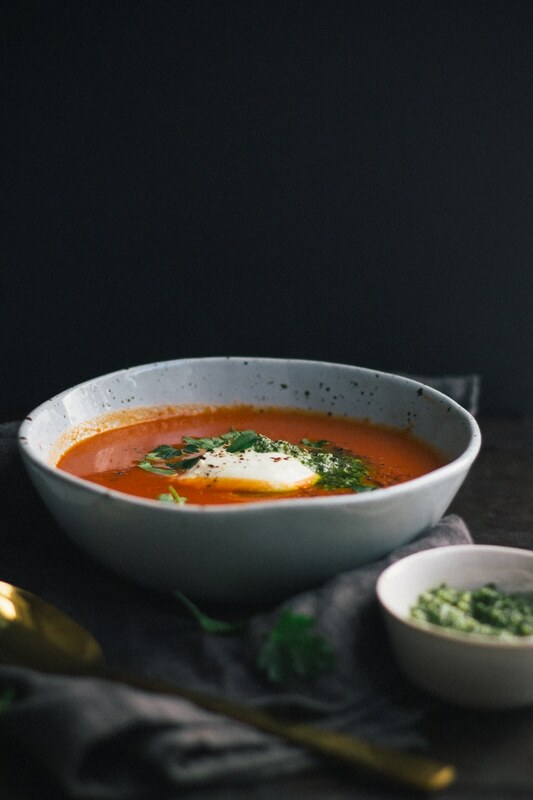 I always crave soup in the winter and I am such a fuss pot when it comes to soup. I used to love canned soup and even (gasp) powdered soup, but in my old age (read: mid-30s) all I can eat is homemade. Occasionally I stretch myself to those packeted things you get in the chilled section of the supermarket, but even then I can only stomach the pumpkin ones. So when it comes around to winter, I just have to make my own. Problem is, soup takes time and effort. Well…. …not this one. Firstly, we’re using tinned tomatoes because who can afford tomatoes in the middle of winter. They are also much easier to have on hand in the pantry. Secondly, you don’t need to leave this to cook for days. Just throw the tomatoes in the oven, roast with the garlic then into a pot and blend. That’s it. Easy and weeknight friendly. 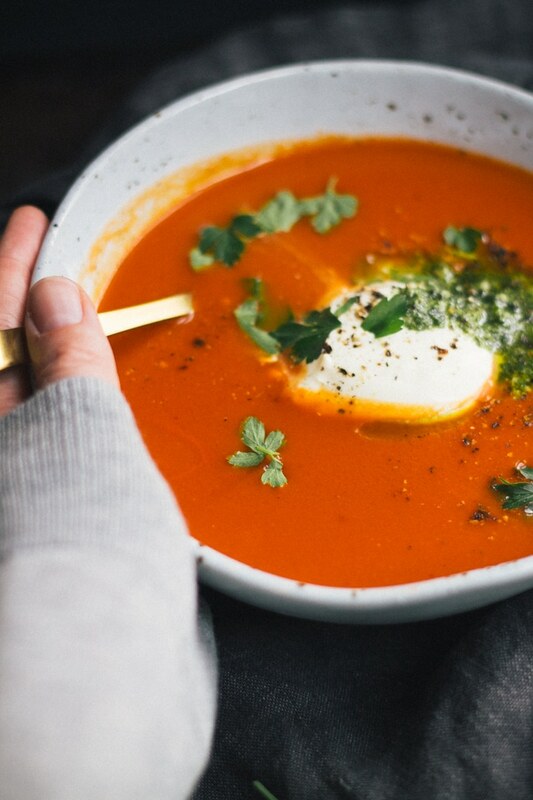 So easy that this was one of my go-to meals after my second son, a winter baby, was born because there is nothing more comforting than a big bowl of warming homemade soup. So, after you read the recipe you may freak out just a little or maybe you’ll think it’s just a typo: 1 bulb of garlic. Yup, I meant to write that. Don’t worry, when you roast garlic it no longer has that powerful flavour of raw or even sautéed garlic. Instead it becomes all sweet, mellow and sticky. It is pure heaven. When you roast it for the soup I suggest you throw in another one and save it to mix through dips, add to mashed veggies or even just smeared on a piece of crusty bread as a snack. It is delicious! It is also first date friendly, it won’t leave you smelling of garlic…too much. Anyone else a massive fan of creme fraiche? I love it. Savoury or sweet. It’s like a really tangy version of mascarpone. So if you find it a little pricey you can always substitute it with mascarpone or even sour cream, but if you can try creme fraiche, there’s only a little needed in the recipe. Okay, that’s enough sleep-deprived-incomprehensible-drabble from me. That’s for battling through and sticking with me through the post. I’m off for a nap. Preheat oven to 170C/340F on fan bake. Place a sieve over a medium size bowl. Drain tins of tomatoes. 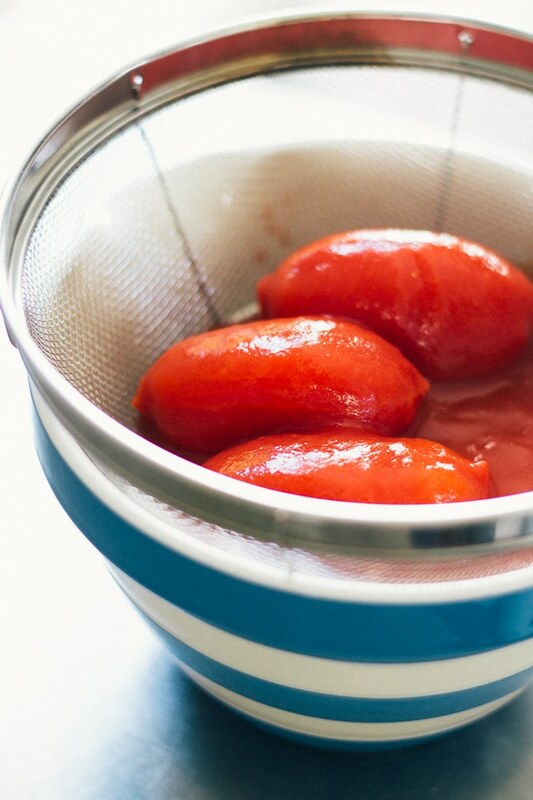 Gently squeeze the tomatoes to remove as much liquid as you can (it doesn’t matter if they rip a little). Set liquid aside and discard any excess seeds caught in the sieve. 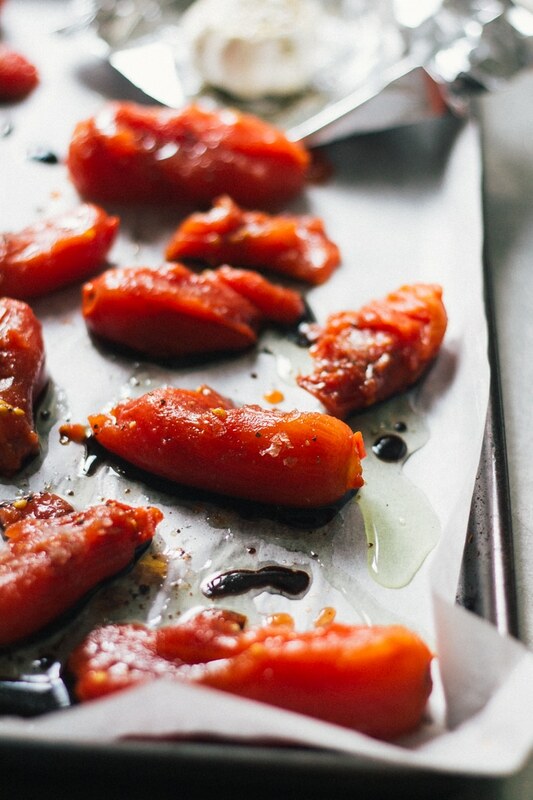 Arrange the tomatoes on a baking tray in a single layer. Drizzle over 1 Tbsp olive oil and balsamic vinegar. Sprinkle over 1 tsp salt and 1/2 tsp pepper. Cut top off garlic bulb exposing the cloves. Place in a small square of aluminium foil and drizzle with 1 Tbsp olive oil. Season with remaining 1/4 tsp salt and 1 pinch of pepper. Close the aluminium foil up around the bulb to form a tight pouch. Place on baking tray with tomatoes. Place tray in the oven and roast for 30 min or until the tomatoes are starting to caramelise and the garlic is tender. Often I find I will take out the tomatoes after 30 min then return the garlic to the oven for a further 10 min, but this depends on the size of your garlic. Remove the garlic from the oven when it is tender. Place tomatoes (plus any juice on the baking tray) and tinned juice that had been set aside in a large pot over medium heat. When the garlic is cool enough to handle, squeeze out the roasted garlic from it’s casing and add to the soup. Remove from heat then either using a stick blender or transferring to a blender or food processor, blend until smooth. Return to the pot with the stock and place back on the stove over medium-high heat. Bring back to the boil, then reduce the heat to medium-low, cover with a lid and simmer for 10 minutes. Taste and season with salt, pepper and brown sugar, if required. I like my soup rather thick, but if you prefer yours thinner feel free to add more stock (or water). Remove from heat, transfer to 4 serving bowls. Top with a dollop of creme fraiche and a tablespoon of pesto. 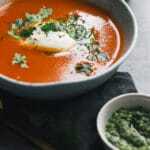 Alternatively, whisk through the creme fraiche and pesto while the soup is still on the stove, then transfer to serving bowls. Serve immediately. This is beautiful! Delicious and easy, too. Thanks so much Beejay! Yes, I love anything that’s easy!